Every business, start-up or enterprise, is challenged with increasingly changing working environments. For some, operational budgets are being squeezed for better value for money, whilst seeking to improve resource and technology to meet their expanding objectives. In the modern day and age of online transactions and multi-channel communications, exceptional customer service is essential for customer satisfaction and retention. The voice channel or ‘traditional’ telephony is a critical business communication tool relied upon by many businesses and their clientele. Cloud telephony is a cost effective, reliable, scalable and secure option to enable businesses to better operate in these environments. Until recently, this type of sophisticated communications solution was available only to companies with the necessary financial resources to design and implement their own customised phone system. Today however, the Internet and cutting-edge communication technologies are driving down costs, lowering adoption barriers and opening new communication options. These allow businesses of all sizes to benefit from large-scale features of corporate-class business phone systems – but at low prices and high flexibility. 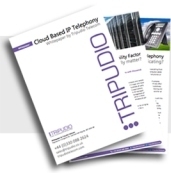 Be the first to comment on "Tripudio Cloud Based IP Telephony Whitepaper Now Available"